Murder of Archibald Grim - a teen mystery party. 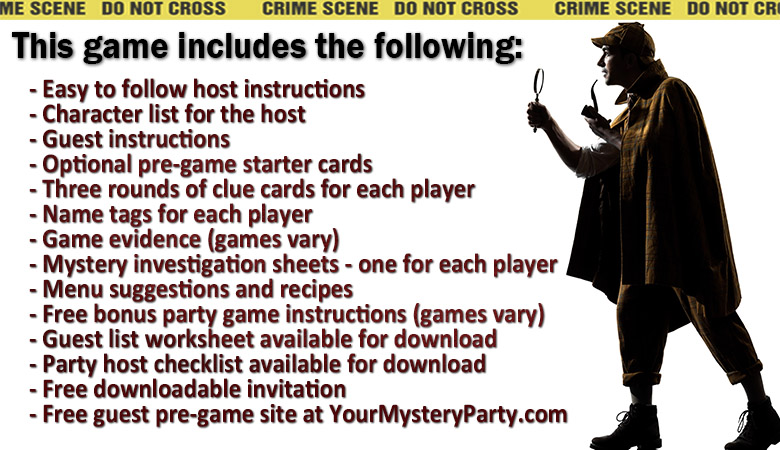 A fun teen mystery party for 8-16 players, ages 12 to adult, in a traditional-themed castle setting. This will be an easier sleuth for adult groups. The victim is not a player in the game. This party may be hosted in a home. This is the instant download upon purchase version of the game. There's nothing to be shipped, as you'll have everything you need with the download - no waiting, no shipping fees! Easy to host, easy to prepare. 13 year old theatre kids? It's a hit! We used this pack for my daughter's 13th birthday party. We had 18 girls aged 11-16. I love that the murderer is a mystery until the very end! I think only 4-5 girls guessed the answer correctly - they all had great thoughts on it and everyone had a BLAST! The characters are funny and leave a lot of room for the girls to make them their own. Loved that the game was murder, but in the cleanest and least gory of ways - if that even makes sense. Had a group of ten teens from 11-15. The challenge was great, and only three of the players got it right, but I think that's super! They were boasting for hours!! !